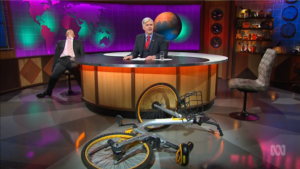 So much to be mad about… – Shaun Micallef Online! I couldn’t wait for Shaun – and his great team – to return to MAH. Now, it’s about to finish – final episode next week. Not so sure about TAYG, but any Shaun is better than none. I do hope there will be a 2nd series later this year. I look forward to that. I wonder if there will be another series of ‘The Ex PM’ or is that asking too much of Shaun?? Apropos of nothing – and Shaun might appreciate that – I noticed that various ABC presenters were struck down this week. No Tony Jones – 2 weeks running – and then Leigh Sales. Last night it was Stan Grant’s turn. Hope this is not an ominous sign. Love the ABC which increasingly has great programs! Yes, I think companies not paying tax should fund the ABC and/ or the PM could simply give the ABC more money. After all, the Coalition’s largesse extended to the $122 million non-binding SSM postal vote, and now $100 million for a memorial for Anzac Day, and that’s without the proposed company tax cuts. What was that about Labor being the big-spending Party?? Sorry this is so long and winding. Thanks for a great show, yet again. 65% should be a minimum requirement for Shaun. We love you, Shaun!